I mean, I’m just a dreamer. Deep down, in those ten seconds as I tried to imagine not what I thought I would be but what I could be if I had my druthers, I knew I would always be a writer—was one regardless. But I also saw another dream I hadn’t discovered until earlier that year. She blinked, nodded, assured me that was a good goal, and moved the conversation on. I felt a little silly, especially as the opportunity the lady laid out was so contrary to who I’d just described. But at least this was an opportunity, I thought. It wasn’t as if any publishing houses were knocking on my door, after all. I learned that day that dreams make us feel out of place. If they didn’t, we would be too comfortable to pursue them. (Click to Tweet) I felt like my town and its limited opportunities would force me to choose between doing what I loved or living where I loved. Was I being irresponsible by staying? Or was lifestyle more important than a whimsy? After all, my calling is to be a writer, and I can do that anywhere. I might have a nose for talented writing and potential, or I might only be particular and opinionated. That didn’t mean I had any business fancying a job as an acquisitions editors. I put it behind me. But I never forgot that conversation. Or that date. Sometimes, I was disgusted with myself for vocalizing something that was never a possibility (at least, in the way I’d imagined and in that time frame.) I’d remind myself as another year was gone, that dreaming is futile. Only action matters. And what plans have you made to institute this desire? None. It’s your own fault. I still believe that dreaming without action is futile—most of the time. Other times, when your dream also happens to be God’s dream for you, it’s going to happen no matter what you do or don’t do. You see, I applied for an associate editor, remote position at an up-and-coming fiction magazine. Even though my plate was already pretty full, I couldn’t not apply, somehow. I was hired with the understanding that I would, in a couple issues, transition into the lead editor role. I was amazed and excited. And scared. A few months into it, I learned the magazine’s editorial process was altering a little, and I’d have a new duty: none other than acquiring stories. That conversation about my two-year goals occurred two years ago this past Saturday. And now I can say I’ve undergone training and been able to do one complete batch of acquisitions. But don’t get me wrong: I’m not saying I’m successful or that I don’t struggle with my work and career path. Quite the opposite, let me assure you! But I do say all this to demonstrate that when our dreams are God-given, He will fulfill them when, where, and how He pleases. (Click to tweet.) In those two years, not much about me, my area, or my education—the three things I’d put my focus on—changed. And yet, God granted me a desire of my heart. A desire He planted there. A desire He provided for. It may not have been exactly what I thought the dream would look like, but it suits me and where I am in this season perfectly. That’s how I know the best part of dreaming God’s dreams: they’ll always come true one way or another. I’d love to hear from you. How have your God-given dreams come true? 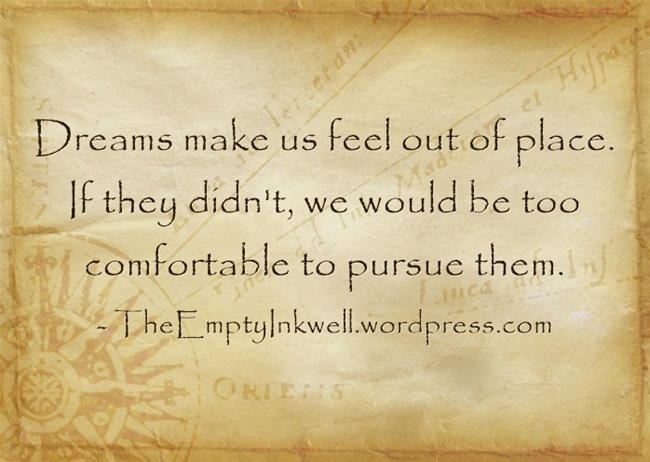 How do you hold on to the dreams that haven’t yet come to pass? Enjoy what you see here at The Empty Inkwell? Please consider signing up for my newsletter or following me on Facebook or Twitter. I would like an endorsed copy when you finish. Hey, Donna! Great hearing from you. I definitely hear what you’re saying, and I hope you know that you inspire others with your service, faithfulness, and obedience as you follow your God-given dream and calling. As artists, we have big dreams, and we never feel we’re doing them justice. We work hard and wonder if we’re spinning our wheels, but I’m learning that with God, no effort is wasted. I know for each one of us, when we get to heaven, we’ll be able to see how every dream God placed in our hearts was in one way or another used for His purpose and glory. In the meantime, as you said, we follow. And that is its own reward, after all. 🙂 Thanks for commenting and sharing, Donna. Always a privilege to hear your heart. I had thoughts about how my life was going to go, “just” being a mother and wife and homeschooling. I loved that–a “simple” but lovely life, I thought. However, I found that wasn’t God’s plan for me when I fell ill with extremely severe Toxic Injury…but He gave me a new dream!! Because of being bedridden with this illness, and unable to take care of myself most of the time, much less the kids and house, God has enabled me to blog & self-published 4 children’s books while in bed. It is something I NEVER pictured myself doing, but I am amazed and happy at where God has led. I do dream that one day I might be able to significantly help provide for our family through writing–I have at least 18 more books planned or partially done. 🙂 But one dream I have had for over 5 years is right now being fulfilled–a safe, low-tox home built specifically for my Toxic Injury. We will move in probably in the next couple months. Praise God!!!! Congratulations and praise God for your new position!!!! Thanks so much for sharing, Christa. 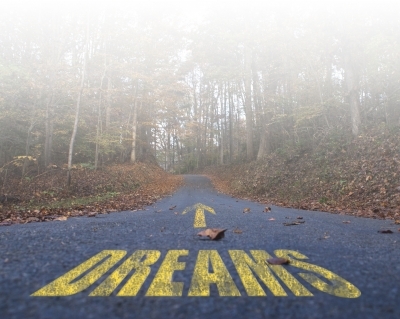 Isn’t it amazing how God directs our dreams as we change and grow? I look back at all the things I never would have done/experienced had not X, Y, and Z happened in my life, and I always find myself grateful for God’s faithful steering—though, granted, that was not my default response during those difficult times! Your story sounds fascinating, and I pray the new dreams He’s putting in your heart will be soon fulfilled, Christa. So excited that this dream has come true for you, Meagan! 😀 God is so good. So cool and faith-building to hear stories like this! Thanks, Lizzie. 🙂 It’s always interesting seeing how God has things turn out! And glad it could be an encouragement for you.